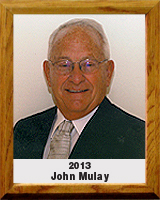 John attended Grand Junction Colorado High School from 1957-1960 where he was on both the varsity wrestling and varsity baseball teams. He attended the University of Arizona and graduated with a degree in Physical Education in 1965. He then began and ended his 36 year teaching-coaching career at Pueblo High School in Tucson. In 1967-68 he became the Pueblo High school freshman wrestling coach under Joe Katusz. His freshman team went undefeated that year. The following year, 1968-69, he took over as the head varsity coach. He coached the varsity and junior varsity teams for the next 26 years. During this period of time his teams won two State Championships in 1975 and 1992 and six division titles. He coached 14 State Champions, 39 State place winners, 45 division champions and 175 division place winners. His dual meet record for his career was 186-60-2. John was selected All City Coach in 1970 and 1975. He was also selected Southern Division Coach of the Year four times. In 1975 and 1992 he was the 5A Coach of the Year for Arizona. During his last year of coaching in 1993 he was inducted into the Arizona Wrestling Coaches Hall of Fame and received the Tucson Conquistadores Sports Award. In 2005 he was inducted into the Arizona chapter of the National Wrestling Hall of Fame in Stillwater, Oklahoma.